Change several attributes of files. Is there a better alternative to InfoDoc? Is InfoDoc really the best app in File Management category? Will InfoDoc work good on macOS 10.13.4? 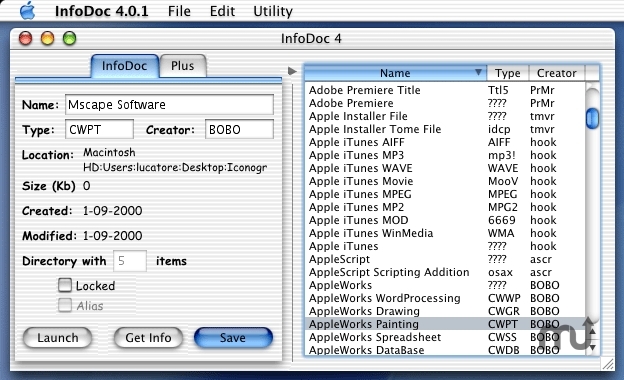 InfoDoc allows you to change several attributes of files that you can't normally do in the Finder. Some of these attributes are: Type, Creator, Invisibility... The most useful feature in InfoDoc would have to be the preset options. This changes the selected file's type and creator to match that of a specific program. Italian version is available here. InfoDoc needs a review. Be the first to review this app and get the discussion started! InfoDoc needs a rating. Be the first to rate this app and get the discussion started!